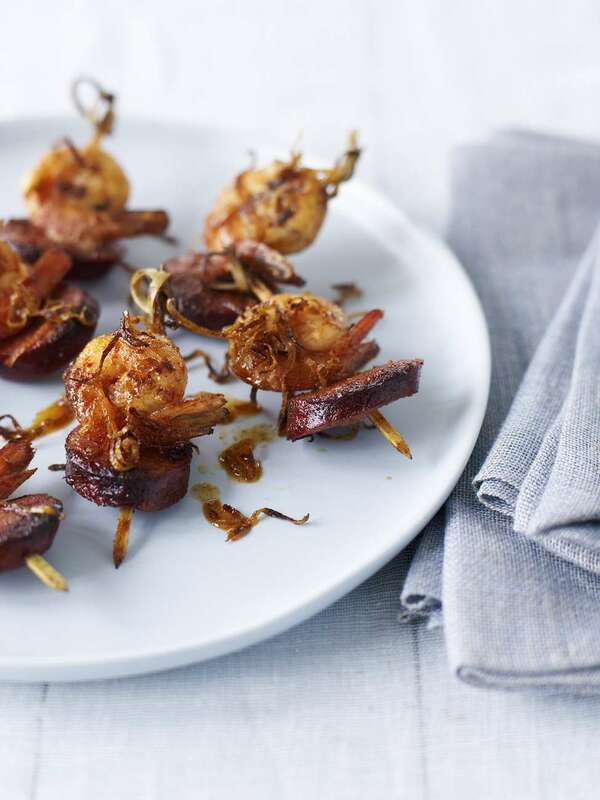 Prawns and chorizo sausage may seem an odd combination – meat and seafood often is – but these two ingredients really do complement each other. 1 If prawns are frozen, thaw them quickly in a sealed plastic bag immersed in a sink of warm water. Twist off their heads, then peel off shells, leaving the small piece of shell on the tail intact. Using a small sharp knife, slit down the back of each prawn and gently extract the red or black vein. Rinse prawns, then pat dry with paper towels. Dust skewers with a little paprika. Drizzle with oil and scatter with the zest of 1 lemon. The skewers can be prepared 1-2 hours ahead; keep them refrigerated until cooking time. 3 Cook on a preheated lightly oiled barbecue hot plate over a medium heat until chorizo has coloured and prawns are cooked through. Watch the lemon zest though as it cooks quickly: remove pieces to a side plate once they are golden. Alternatively, cook prawn & chorizo bites over medium heat in a little oil in a frying pan. Serve hottish scattered with the zest of the second lemon. Bubble & Squeak ... What a name! Gorgeous stuff. You have to make it! Mini buffalo mozzarella balls are so cute but treat them carefully because they are wondrously soft.